Chelsea are reportedly interested in joining a new enlarged G14, with Celtic and Rangers also "towards the top of the pile" of new applicants. "We hope to expand to double our membership by the end of the year," said G14 general manager Thomas Kurth. 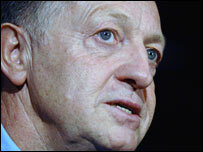 Lyon chairman Jean-Michel Aulas has also been elected David Dein's successor as president of the G14. Aulas' election came at a board meeting in Glasgow on Thursday. Dein, who had been just six months into a two-year presidency, relinquished his position after leaving his post as Arsenal vice-chairman last month. One source told Reuters news agency that some clubs, most noteably Arsenal and Manchester United "felt uncomfortable with the idea" of Chelsea joining. Formed in 2000 to give its members a greater voice in the running of the game, the G14 admitted four further clubs in 2002. About 20 clubs have expressed an interest the G14 since its formation seven years ago. "We'll outline the criteria in the coming months, one of which is already agreed and that's sporting excellence," said Kurth. Excellence will be measured mainly on a club's performance in European competitions and will take into account their Uefa club ranking. "But if a club has a geographical advantage, this could compensate for a poor ranking," said Kurth. Fifa, whose president Sepp Blatter has labelled the G14 clubs as "greedy", has refused so far to accept responsibility. Europeaen governing body Uefa is also convinced the G14 group continues to harbour hopes of breaking away from the Champions League.